There is a song by Don Potter which has been in my head. A portion of they lyrics are, “I can make it to the end if I can just see His face.” A while back I heard Heidi Baker, a missionary to Africa, describing a time when she had seen the face of the Lord in a vision. She described his deep, piercing, beautiful eyes, the love seen in those eyes, and more that I cannot even remember at this point. A few weeks ago I started trying to close my eyes and see His face. I am longing in my soul to see those same deep, beautiful, piercing eyes up close just as she did. But when I close my eyes I either see His face in a very transparent way or I see Him standing a few feet away. But i haven’t gotten the close-up of His face that I long to see. So this morning as I was thinking about this, the thought came that how well we see His face depends on how closely we follow Him. So if you (or () want to see that face up close and personal, we have to be following Him that closely! Alternatively, if we only follow from a distance, we will not be able to see His face except from a distance. A lot of times when I’ve read this verse or heard others refer to it, we/they seemed to stop after the first part, “Draw near to God and He will draw near to you.” But the verse doesn’t stop there. The rest of the verse says, ” Cleanse your hands, you sinners, and purify your hearts, you double-minded! Oh. So the later part of that verse tells us the secret to drawing close to the Lord. We have to cleanse our hands and purify our hearts and THEN we can draw near to God and He will draw near to us! No matter how closely we walk with the Lord, we can always come closer and closer. I want to be “whisper close” as Leonard Ravenhill once said. And then, I will be able to see His face! Lord help us to forsake sin and the things that set us behind and let us wash our hands of those things, purify our hearts before You, and draw near. We want to be near to You! 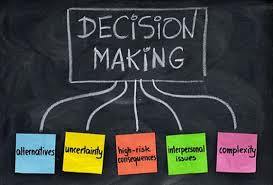 Note: For my readers who use screen reading software, the picture above has a sign that says, “Decision Making.” From that sign flows lines with a word attached to the bottom of each line. The words are: alternatives, uncertainty, high-risk consequences, interpersonal issues, and complexity. On Monday of this week I had the privilege of going to Dallas, which is about 2 hours from where I live. I say privilege because I’m a city-girl who likes to live in the country! That’s weird, right? It’s just that I love the things of the city such as Starbucks, Chick-Fil-A, nice places to shop, etc. But at the end of the day I like to retreat to the peace and quiet of the country where I can sit on the back deck and look at the trees and hear the faint music of wind-chimes. The best of both worlds! It was a nice escape from my wonderful, but rather small town. I used to go with the girls to the Dallas metroplex quite often for fun outings. The primary reason for the trip to Dallas was that I had to go for a doctor’s appointment with my spinal cord injury specialist, Dr. Rita Hamilton. She was the doctor who took care of me while I was in Baylor Institute for Rehabilitation. The visit went well. Everyone has been telling me I have lost weight, and they are correct. I’ve lost about 15 pounds since coming home in April. That is a total weight loss for the year of about 55 pounds! But back to the city…. My friend that went with me suggested we try S&D Oyster Company in downtown for lunch. My cousin Rebecca and her husband James joined us and we had a really nice visit. The fellowship and the food were both great! The service was outstanding as well. I highly recommend it. It’s on McKinney just down from the Crescent Hotel. After my appointment, we went to see my friend’s nephew, a 2-year-old baby with special needs. It was so good to meet him and his family. The baby’s mom had brought food to my husband while he was with Emmarie at Children’s following our accident. I had heard all about them from my friend, so it was nice to finally put faces with names. Our next stop was Starbucks. First decision: what to order! I love Frappaccinos and hot coffee alike, but only the flavored stuff. I narrowed it down to Mocha Latte or Java Chip Frappaccino, and chose the later. This was my first Starbucks since August! And it did hit the spot. Next stop: Verizon store! It was time for an upgrade from the iPhone 4s to something else. But what? The choice came down to iPhone 5c, 5s, or totally switch and go with a Samsung Galaxy. For a few years I’ve been sold on Apple because of the built-in accessibility features, particularly the Zoom feature. It’s not enough just to make the font bigger in text messaging. I need to be able to increase fonts in the entire display. I wasn’t sure if the Galaxy would allow that or not. But I knew one thing. The screen was SO much bigger! So I looked at the Galaxy Note 3 and had the sales person show me how the acccessibility features worked. And I loved it…. it IS perfect! The iPhone 5c/5s screen is only taller, not wider. But the Galaxy screen is both taller and wider and allows me to make the print larger than on the iPhone and still be able to read more than one word or two at a time. On the iPhone I would sometimes have to use VoiceOver to read content to me because on webpages I couldn’t get the print big enough. Sometimes that is nice, but I mostly prefer to read it myself. Once I was sure that my photo stream would sync with my iPad, I was more or less okay with trading in the iPhone and getting the Galaxy Note 3. I was also upgrading the wireless card for our home internet. So that was another decision in itself, but I think I made a good choice. I hated the Verizon Mifi card that I had and so far am relieved at how easy to use the new Elipsis Jetpack is to use. Whew! The guy at the store told me I had 2 weeks to return anything. Well, about 2 days into using my wonderful new Note 3, I was ready to trade it in and get my iPhone back! Why? Because my iPhone friends couldn’t text me. And it was SO different. I didn’t like the learning curve at all. But on the other hand, I was enjoying toying around with new technology. Mixed emotions. But I had to figure out this texting thing. Some friends helped and we figured out that iMessage in their iPhones had to be turned off and set to send texts via SMS. I think the iPhone tries to send texts as iMessages first, but only iPhones, iPads, etc can receive iMessages. So everyone did this and now the problem is fixed. I’m still trying to figure out how to do some things, but I LOVE this phone and I’m happy with my decision! In life we are always faced with decisions. Some are big and some are small. The Lord cares about every detail of our lives. And especially in life’s critical decisions, we need to be led by the Holy Spirit. What decisions are you faced with today or in the near future? We know we can cast our cares on Him, because He cares for us. I hope you’ll enjoy my guest Jeremiah Hubbard’s post. I did! Did you know that by Spring, 68% of Americans who made a New Year’s resolution will have broken it, and that only 15% will claim success after one year? We are nine days into 2014 and that means that a lot of people are already struggling to maintain the resolutions that they set for this year. While some may have set new resolutions, others are simply reviving the dead ones they have moved to resolve year after year. Why is it that we make resolutions, but fail to meet them? Where do we fall short when we don’t meet these challenges that are laid out at the beginning of every year? Who is keeping us from reaching the goals that we have set with great intent? When do these goals disappear and more importantly are not even missed until the clock strikes 12 every 1st of January? How do you keep from getting fatigue before the first 3 months of the year are even over? Simply put, the answer to all these questions can be found in the resolutions themselves. But, before we get to the answer, let’s find out what type of person you are. Do you make resolutions? If yes, keep reading. If no, keep reading. Many people make resolutions but fail to keep them, while others make no resolutions at all. The ones who don’t make resolutions have come to realize, “Why even make a resolution? Look at all of the people who make them, but don’t keep them.” While many of the ones who do make resolutions, only do so to satisfy some need to feel empowered when going into the New Year. They set goals like: This year I will lose weight. This year I will spend more time with my family. This year I will further my education. This year I will reinvent myself. The list goes on and on. Notice there is a beginning, end and desired outcome. To take it a step further, there are milestones. Milestones? Yes. These are the micro-goals within your overall resolution. In the above example, this is the number of pounds that are to be lost each month. By setting up micro-goals it will be easier to stay on course. This formula will work with any resolution that you may set. By writing a definitive statement of your resolution with a beginning and end date, how the resolution will be accomplished, along with micro-goals along the way, you will be on a better path to see your resolutions resolved, rather than being passed on to the next year. You will also want to post the resolution in a place where you will see it at least a couple of times throughout the day. For example, post it by the bed so that it is seen first thing in the morning and last before going to bed. If you are trying to lose weight, post it on the refrigerator. To get the most out of it, save it as the background to your smart phone, put a copy in your car, on your desk, well you get the point. In the classic piece, Think and Grow Rich by Napoleon Hill, Mr. Hill makes this statement, “Before success comes in any man’s life, he is sure to meet with much temporary defeat, and, perhaps, some failure. When defeat overtakes a man, the easiest and most logical thing to do is to QUIT. That is exactly what the majority of men do.” The first thing to resolve is that you will not QUIT! Don’t overload yourself on resolutions. Take one resolution that you want to accomplish and focus on it. As that resolution gains momentum, introduce a new resolution. Use the formula and stagger them out and in no time, you will see that you are accomplishing the resolutions and moving forward! For years now I have worked in a career of helping others; helping children who are blind or visually impaired to learn, helping families find resources, and have even been on the receiving end of these same services myself as a child and adult. Texas has an excellent entity called the Division of Blind Services under an agency called DARS. The Blind Children’s Program and the transition program offer a huge amount of support to qualifying consumers. As an adult the Vocational Rehabilitation program has been a huge help to me personally. I wear biopics for driving. These are glasses that help me see the details like reading signs through telescopic lenses. They are very costly and the VR program has purchased these glasses for me on 3 different occasions over the pat 20 years. For this I am extremely grateful! I have never had a single problem with the Division for Blind Services. I cannot, however, say the same for the Division for Rehabilitation under DARS. You see, the rehab division has a waiting list for services. I remember a few years ago the state was going to impose a waiting list for the blind children’s program and the visual impairment field fought it heavily – and we won! Hmmm… wonder what happened on the rehab side? When I was in Baylor still in Rehab, I was told I needed to call DARS rehab division as soon as possible to apply and get on the waiting list for the comprehensive rehab program. I did this. That was in April. By August I think I finally got on the waiting list. But by that time almost all that the comprehensive rehab program would have paid for was already done – through a ton of donations and volunteers. This included things like my home modifications including the addition of an accessible bathroom and closet and purchasing a wheelchair accessible van that I can drive. But at least I was on the waiting list and that would pay for additional physical therapy. But then one day my counselor calls me and asks me if I think I would rather apply for vocational rehab services since I was already back to work part time. The point is I DON”T KNOW! That is what they are for… to inform me! Unfortunately, I couldn’t get to the phone the day she called, so she left a message. And since then I have been unable to reach her – I’ve left her messages. So also back in August I applied for other services through an agency called DADS – Division of Aging and Disability Services. They have a program called Community Based Alternatives. I understand they would pay for someone to come in and help with household chores and getting me dressed. They would approve so many hours a week. In August they told me that in a couple of weeks someone would call to arrange an evaluation. No one called until November! Then the person, who was really nice, just wanted to know if I was still interested in the program. I said “yes”. She said services would be available in December and someone would be calling me to set up an evaluation. It’s January and no one has called. A few weeks ago when Richard hurt his back and we could not cook, clean, and get me dressed, it all came to a head. Stress levels were high. Our friends came to our rescue, coming in to get me up in the mornings, help me to bd at night, bringing food, doing the dishes, taking out the trash, etc. But I got on the bandwagon of trying to rouse up some services. My friend who is a social worker gave me the phone number for the local DADS office and my interest list number – that’s like my account number, essentially. I called the number and the first option was to apply for services. That’s not what I needed. The second option was for people who already had services, and none of the other options applied to me. I ended up calling back numerous times and trying eat option. But i never once got through to a person. It would tell me to call somewhere else “for information” – no doubt more pre-recorded messages. Sorry for the rambling… but here’s my point at last…. I’m now paralyzed, my husband is blind, and we can’t get help. But there are plenty of other people much better off than we are physically, and they get help. They have people coming in to do the very things we need done. But i can’t even get someone on the phone! This is ridiculous! I’m not down on people who get services they NEED, food stamps, all of it. But when we had to fight like crazy just to have our mail delivered to a mailbox at the end of our driveway instead of the community mail box location, which is totally inaccessible, and now we can’t even get an evaluation…. REALLY? This situation makes me understand what parents go through sometimes when they have children with multiple disabilities. They have to learn to navigate “the system” and what a disjointed “system” it is. So many acronyms, people, programs, guidelines, etc. Helps me understand what they go through and their frustrations. Ever the last two months I have spent nearly every Tuesday and Thursday afternoon in physical therapy. We have been working on improving my transfers from the bed to the wheelchair, or as the case is in therapy, from the mat to the wheelchair. I have also been doing exercises that strengthen my arms and shoulders including my triceps. Having strong triceps really helps with the transfers. Additionally, I have worked on my core strength and have done exercises like partial sit ups and isometric exercises to strengthen my neck. Today when I arrived my therapist Jim told me that it was the end of two months of therapy and he would evaluate where I was and where we want to go from here. So after doing some working out and then several tests we determined that I have gotten a a lot stronger since starting therapy and that I have mastered my goals including making independent transfers. So today was my graduation day from physical therapy. I will continue to work on strengthening triceps, biceps, shoulders and knack using home exercises and also possibly working out at the fitness center. So with a handshake and a hug we all wished each other a happy new year and that was that! This is the most perfect timing anyone could expect. That’s because the last time I was at Baylor to visit my PT, Kaylea, from there, she challenged me with being able to make transfers independently by my next doctor appointment in January! She had me promise to come by and demonstrate it for her! So hopefully in a few weeks when I go see Dr. Hamilton I will be able to do just that.